American Express (AMEX), a banking industry for more than a hundred years, partnered with ABS-CBN Lingkod Kapamilya Foundation’s Bantay Kalikasan. More than 50 employees from their office based in the Philippines planted 400 seedlings of Bignay-Kalabaw trees at the La Mesa Watershed’s Forest. An American Express employee shows off the seedling he is about to plant during their employee engagement activity with Bantay Kalikasan in La Mesa Watershed. Bignay trees are endemic in the Philippines and are commonly used to make vinegar, wine, and brandy. 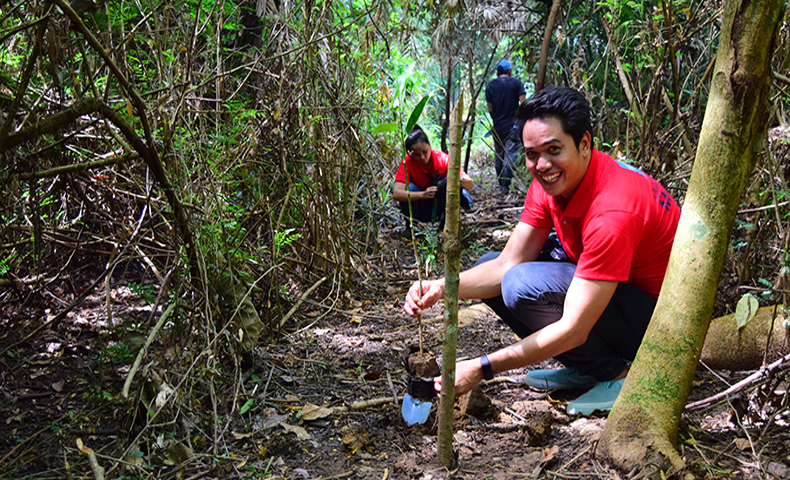 Tree-planting at the La Mesa Watershed is one of the pursuits of ABS-CBN Lingkod Kapamilya’s employee engagement activity. Organizations, such as AMEX, are encouraged to take part to mobilize their employees to participate in these worthy causes. To know more about Bantay Kalikasan, visit www.abs-cbnfoundation.com.